I got into brewing beer a few years back. It’s a fun process and the results are almost always drinkable. We’re fortunate to have a great homebrew store in town with very knowledgeable staff. I often talk to them about different ingredients and techniques. Once, I asked one of these guys about malting barley myself, a process that involves sprouting the raw grain and then roasting it. He said it was pretty complicated and not worth the time. “They’ve really got the process down at the malting facilities. It wouldn’t be efficient to do it yourself,” he told me. This struck me as very odd coming from an employee at a homebrew shop. This guy’s job depends on a lot of folks thinking efficiency really isn’t that great. People brew for a lot of reasons. For me, it’s enjoyable; I love the smell of hops and grain on the stove, I like to experiment with flavors, I like to learn more about beer, knowing about the process heightens my enjoyment of the beverage, and it maybe saves me a little bit of money. And other people have other reasons for brewing. But no one brews beer because it’s efficient. Spending hours by the stove, waiting for weeks, bottling, waiting for even more weeks; clearly this is completely inefficient if you just want a beer. Efficiency would be driving down to the gas station, buying beer, and driving home. For our family, much of what we do is decidedly inefficient. Keeping chickens, growing a garden, even homeschooling; none of this is efficient. But we still choose to do these things. Some of our reasons the world can understand, cost, quality, etc. But there’s more to it than that. There are “factors” that don’t quite fit into a modern, industrial way of thinking. There’s nothing inherently wrong with efficiency, of course. For many of the tasks I perform, I simply chose the most efficient way of doing them. But efficiency is not a Christian virtue, despite what Adam Smith may think. Scripture does tell us the Lord is swift (Malachi 3:5, Isaiah 19:1) but it more often describes his ways as unsearchable and unfathomable (Romans 11:33, Job 9:10, Proverbs 25:3). These ways often seem slow which is why the Psalmist asks over and over again, “How long, O LORD, how long? !” Today, it’s still tempting to ask that question, especially as we’ve become more and more entrenched in an industrial way of thinking which values efficiency and speed so highly. But, St. Peter tells us, “The Lord is not slow about his promise, as some count slowness, but is patient toward you, not wishing any to perish but for all to come to repentance” (2 Peter 3:9). God may seem inefficient to us but, in his Glory and patience and beauty, He is working all things for the Good of those who love him in a great cosmic drama of redemption. And, so, we join our prayers to this great work, no matter how slow or inefficient it may seem. We ask our friends the saints to pray for us, rejoicing in the communal and ancient nature of our faith. We pray the rosary, repeating the words given us by our Savior Jesus, the archangel Gabriel, and our Holy Mother Mary. We offer up decades of this wonderfully inefficient but incredibly beautiful prayer. I still haven’t gotten around to malting and roasting my own grain. And I’m still getting the hang of the Rosary. It may take a few thousand more Hail Marys. But, as I go, I’m learning to love the prayer -and Jesus- more. How beautifully inefficient! 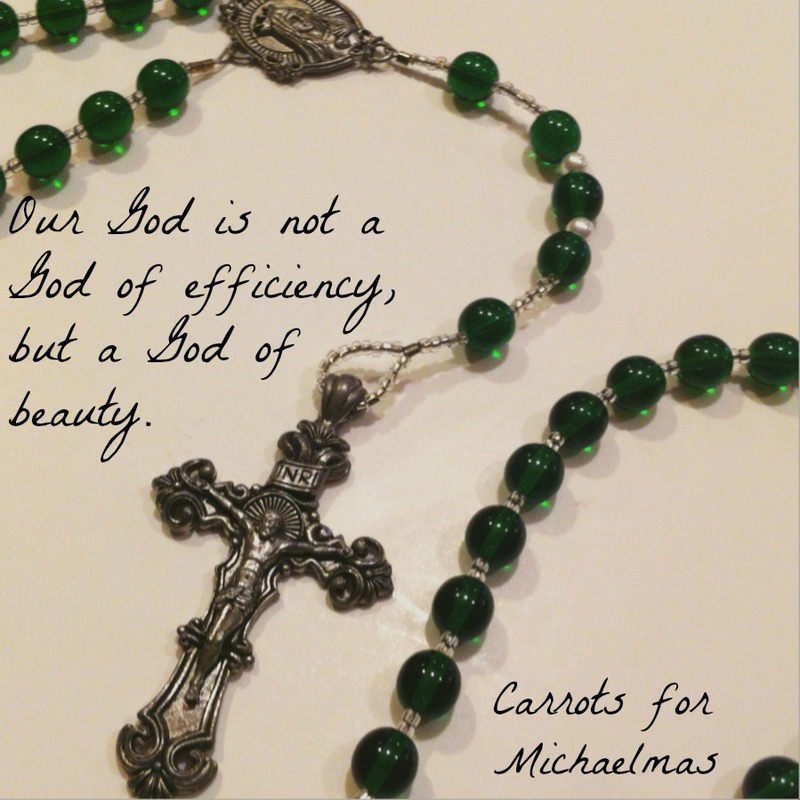 One of the beauties of the rosary I’ve recently discovered is that in it’s inefficiency there’s dedication. It’s more efficient to tell someone “Yep, I’ll pray for you” and whisper a quick “Hey God, can you fix this? Amen” and move on. Praying a rosary takes time and dedication. When I tell someone I’ll pray a rosary that means I’m going to be spending about 30 minutes sending up prayer just for them. It might be inefficient, but I really feel like I’ve given things a good effort in the end. Hmm good post. I’m Protestant, so I don’t do the praying to saints thing or the rosary thing. I have been intentional about “rote” prayers in the past, however- and while I don’t pray to saints, I can appreciate the Catholic view on that. I totally agree with this post, though. We live in such a “fast food” world that we’ve reduced life to the quickest and the easiest. Sometimes it’s a benefit, and sometimes a definite hindrance. At work, for example. I work at a Bible Camp. We serve hundreds of Family Campers ever summer, and we pray for each family at some point during the year. I e-mail or call each and every family personally to ask about prayer requests. Sure, I could just sent out a mass e-mail. It would be faster! But I love spending the time to comment on things I remember about the family and make that personal connection. It’s not very efficient, but it’s a much more quality connection. It’s a dangerous place to be in- one where convenience trumps connection. I heard a speaker once say (Christopher West, I think?) that JPII said that the root of the culture of death was…efficiency. Crazy, right? Definitely something to ponder. Thank God for the inefficient life. It’s usually much more beautiful and filled with much more joy. Thank you for the gorgeous reminder – I need it all too often. I loved this post. It was lovely, and as a side note, very well titled! Thank you for the reminder that taking life “slow” in this instant gratification culture we live in is actually the best, most fruitful and gratifying way to live. I love this. Hearkens to Socratese/Aristotle and the virtuous life- beauty for beauty’s sake. The way it was designed. Liberty,Sexual Irresonsibility, High Productifity and amongst them Efficiency have become pilars of our success and result oriented culture that all of us who lead different life are often seen as time (life) wasters. I know my family thinks I am wasting my life and education spending life as stay at home mother of currently one but effectivelly unknown number of children. Which then reminds me of 1 Corinthians 1,18-29. and my favourite: “The message of the cross is folly for those who are on the way to ruin, but for those of us who are on the road to salvation it is the power of God. It was God’s own pleasure to save believers through the folly of the gospel”. This is a great post. I need reminders like this everyday at my job. So often I get frustrated because things aren’t running as efficient as I would like when I interact with people. It’s not fast enough, not smooth enough, people don’t always listen, etc… Then, I leave the situation feeling frustrated and angry and I find myself trying to “manage people” in ways that dehumanize them down to “driving cattle” levels. I always need to remember that I am interacting with humans with lives, feelings, and souls, and not just a “practiced interaction” with fake enthusiasm or care. After all, where is the beauty in being fake? To me, beauty can often be kind of messy and unorganized. Thanks for the wonderful reminder and personal example! I loved this post – very resonant and beautiful! Thank you!